Even if you are not a student or employed by Arizona State University, ASU has a presence in Tempe, Arizona. Many large buildings in Tempe sport the ASU name, but the campus is accessible to visitors as well. Shops and the atmosphere cater to students and their families. There is also a community feel that the downtown has cultivated where individual shops, not usually part of national chains, create a fun shopping experience. There are places to eat, like Rula Bula (a pub), Chompie’s Deli, and House of Tricks that offer unique dining experiences from easy on the budget to upscale (definitely House of Cards). They had quite a crowd on their second day due to the Festival of the Arts, but were moving things along very briskly. 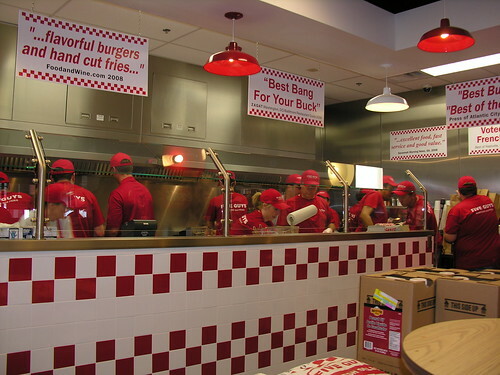 The place was mobbed, but the red-shirted staff handled it all with aplomb. In addition to the aforementioned burgers and fries, their menu also includes grilled cheese, hot dogs and many toppings, like grilled mushrooms, jalapeno peppers, A-1 sauce, all free. The 2-person fries order was GIGANTIC – and that was the small size. My small bacon burger was a large serving. Considering that all of the toppings are free and the food is freshly made (“never frozen”), the price tag is very reasonable when compared with other chains. They also have peanuts available for free that you can scoop out and eat – as much as you like. We spent $16 for our burgers (One large and one small), small fries, one drink and water. Another chain, but a local one, is Chompie’s Deli, which will fulfill anyone’s craving for deli food. The bagels are good –chewy and flavorful – and the enormous menu offers so many choices that your biggest issue will be making a decision on what to order. Old family favorites like giant deli sandwiches and stuffed cabbage, plus new twists like a brisket served in tortillas make it possible for every family member to find something they’ll enjoy. The quality and quantity definitely go hand in hand at Chompie’s, which has been around for 30 years. You won’t leave hungry! In the heart of downtown Tempe is House of Tricks, definitely an upscale menu with white tablecloth service. The food service is excellent and the presentations very appealing. Their restaurant has been around for over 20 years and it is apparent why: exotic and unusual twists on culinary efforts that incorporate the best of many cuisines. One entrée was: Lemon Honey Braised Grouper with Sautéed Watercress, Parsnip Pear Puree and Whole Grain Mustard Buerre Blanc. An appetizer, “Miso Marinated Foie Gras with Ginger Snap and Warm Black Mission Fig Chutney,” put a homemade touch on what could be something served anywhere. Their chef is obviously inventive and committed to using fresh, seasonal ingredients, a quality we very much encourage. So, now you won’t go hungry while in Tempe. We’ve tried other restaurants as well, but these three are worth a trip. Now that we’ve given you places to eat, sleep and entertain yourself, we’ll continue our “Wacky Wednesday” tomorrow with a visit to a casino. You’ll need some luck to win and a means of transportation to get there. We’re back with things to do at Wild Horse Pass Hotel & Casino – besides gaming. There’s something about a college town. I’m not talking about New York City, Boston, or Los Angeles, but rather those small to mid-sized towns that cater to, or are intricately involved with, the day–to-day operations of the campus. But, my pick for this article is Charlottesville. It’s the Capitol of Virginia, but it has also been the Capitol of the Confederacy, a claim no other U.S Capitol can come close to. Although the Civil War has been over for 144 years, the past lives on alongside the present. As a former resident of the city for several years, it’s always interesting to come back and re-visit just why you lived somewhere, and maybe even why you left. In the case of Richmond, I relocated there for a job and left for the same reason. Richmond is a mix of a modern and also a “stuck in the past” city. The latter would be their Civil War heritage. But, that shouldn’t stop anyone from visiting as there are many things to see and do and you don’t have to see a single battlefield, Civil War or Revolutionary War, if you don’t want to, and still have a great time. Are you into literature? Edgar Allen Poe lived in Richmond for over 13 years. The Poe Museum is located on Broad Street (Poe didn’t actually live in the house, but nearby). Furniture from his home, as well as manuscripts, first editions and personal belongings, are on display. Architecture? How about a 15th century English estate (Agecroft Hall) that was bought at auction, crated and shipped from Lancashire, England to Richmond, and reassembled on the banks of the James River. Famous speeches? Revolutionary leader Patrick Henry wasn’t shy about speaking. He gave his famous “stick it to King George” speech, “Give Me Liberty, or Give Me Death” at St. John’s Church in Richmond. Monuments? How about … Monument Avenue? Northwest of downtown Richmond you’ll find Robert E. Lee on a horse … J.E.B. Stuart, on a horse … Stonewall Jackson, on a horse … Jefferson Davis (President of the Confederate States of America), not on a horse. Anyone notice a theme … and we’re not talking about the horses. And then, there is Matthew Fontaine Maury. Who? Seriously, WHO? Arthur Ashe, professional tennis player, born and raised in Richmond. Even if you don’t like statues, the architecture along the avenue ranges from English Tudor, Georgian, Italian, and Art Deco on either side of center islands of huge trees and green grass. It’s the kind of street they don’t build anymore. Historic Theatres with a Pipe Organ? The Byrd Theatre in Carytown, a retail shopping area northwest of downtown was opened in 1928. Included in its 1,300 seat configuration is a balcony and a Wurlitzer Pipe Organ that opens the show on Saturday evenings by rising from the basement to the stage in front of the screen. You can’t buy tickets ahead of time, they don’t show previews, and the movies aren’t first run … but at $1.99, I’m not going to complain! NEXT TIME: We’ll take a trip back in time and look at the Civil War history of Richmond and what remains today. On my recent trip to New York, I had only four hours to spend before it was time to catch my plane back to Phoenix. Since I hadn’t been to visit in several years, I pondered the best use of my time. Should I head to a museum? Stroll through Central Park? Shop? Visit a landmark? The only thing time wouldn’t permit would be a Broadway show – sigh! So, given my four hours, I decided to reacquaint myself with NYC by just walking around. I did not head to a museum or to Central Park, but chose to travel a multi-block path that had some major highlights to see. It was an overcast day, so the brilliant blue skies I was hoping to see just weren’t there. But Manhattan is still impressive, no matter what the weather. 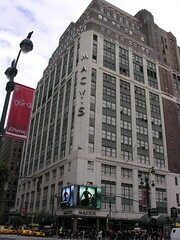 Coming up from Penn Station, one of the first sights was Macy’s, “the largest store in the world.” I didn’t go in, because I might never stop myself in time to catch my train to JFK. A major landmark for photographers is B & H Camera. Located on 9th Avenue between 33 & 34th Streets, B & H is THE place for cameras and photography equipment. They’ve got it down to a science and have probably every imaginable piece of photo equipment. The most wonderful part of the store is the knowledgeable staff because they really know their stuff. Want a flash attachment for a camera? I showed them what I have and they gave me three options! The prices were right and I could leave with my choice, at a good price. And, no, this is not a paid endorsement for B & H, but it was my second visit. They’re impressive and also very security conscious. Be prepared to leave large bags at the entrance to claim when you’re ready to leave. Saddled down with a suitcase, my next stop was Schwartz’s Travel Service where I could leave my suitcase. (Located at 357 W. 36th Street near 9th Ave.) Taking the small elevator to the second floor, I paid $10 to leave my suitcase for the day. Ultimately, I left it for less than two hours, but it gave me the freedom to move quickly. Next, I headed over to 5th Avenue to see the sights: The New York Public Library with its lions guarding the entrance (stone, not live), and both the Empire State Building and Chrysler Building in the distance. I considered a trip up to the top of the Empire State Building (now the tallest building in NYC since the devastation of 9/11/01), but that would have required several hours. I wandered into a street fair on Avenue of the Americas (6th Avenue) that stretched from about 34th Street to 42nd Street. Traffic was closed down for the entire length of the fair with people sampling food and buying the vendor’s wares. There were a lot of people selling jewelry, scarves, and NY T-shirts. The aroma of the food finally made me break down and try an arepa. An arepa is a corn cake sandwich fried with mozzarella cheese melted between the two corn cakes. I chose a poor representation because, while it tasted good, it was very thin. As I marched and munched along, I was seeing the profusion of people and remembering the energy of NYC that I have missed. 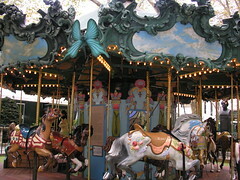 Strolling through Bryant Park behind the giant New York Public Library, I viewed the glorious, recently refurbished carousel, a permanent fixture for anyone young or young at heart. The NY Public Library is getting a facelift on the outside with the back face totally clean and gorgeous, but the front has coverings to protect passersby from the cleaning. 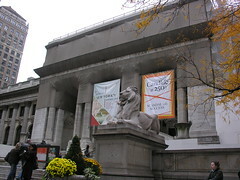 It is an impressive building and many people stop for a photo op near the lions guarding the entrance. 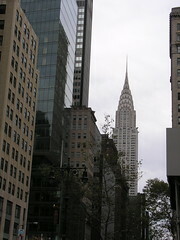 That’s one of the best things about New York City and, especially Manhattan; there is so much energy! The colorful signs, places to see, food choices from street vendors to fine dining, and excitement, can’t be topped anywhere. I know, some might contest that last statement, but I never run out of enthusiasm for NYC and the many opportunities to enjoy. Times Square, entrance to the joys of Broadway, is one of my favorite places in the universe, but this time, the schedule just wouldn’t work. Colorful, thought provoking and dynamic with events and experiences, New York City is the place where I’d spend a week if I could be in any city in the world. But I only had four hours, so I enjoyed what I could and share it here. 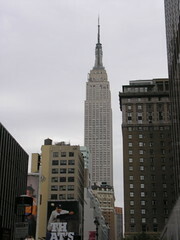 If you decide to go to NYC, get a guidebook like DK or Frommer’s to give you the many choices that you’ll have. And, there are many. Except for my home, I have rarely spent as many hours anywhere as I did in one particular place in New York City. That one place is known as Broadway. 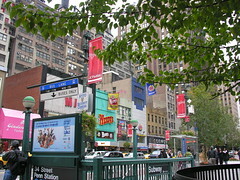 Beyond the physical place, New York City, where theater is the center of the universe and 40 theaters are in a concentrated area, Broadway is a state of mind. Once you’ve been treated to a Broadway show, you’re hooked for life – at least I was.